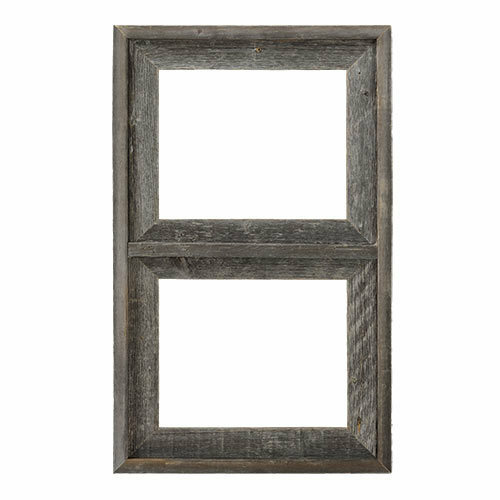 This two-window frame features 8" x 10” windows in driftwood gray. Made from authentic all-American Barnwood. This collage presentation can be hung vertically or horizontally for the ultimate in customization. This wood frame comes complete with non-glare acrylic glazing and everything you need for effortless hanging. Random nail holes add personality and unique, weathered finishes enhance artwork beautifully. What size are the openings for the artwork in the above 2 opening frames? BEST ANSWER: The frame has two openings that are both 8"x 10". Thank you! What size photos fit in this? Thank you for your inquiry. The frame openings are 8x10. So this frame would fit two 8x10 photos.